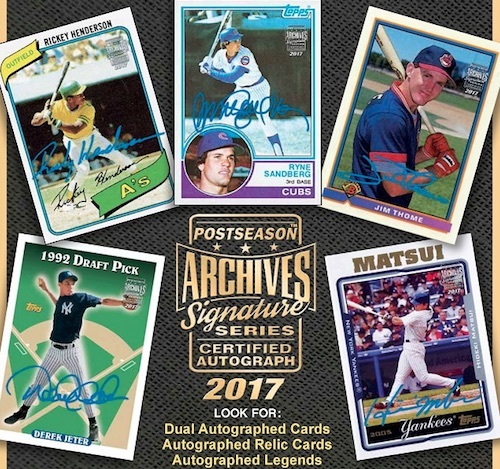 2017 Topps Archives Signatures Series Postseason Edition Baseball is the second set of autographed buybacks of the year. Arriving not too long after the release of an active player product, this one revolves around retired players who were October and November MLB Heroes & Superstars. Each 2017 Topps Archives Signatures Series Postseason Edition box comes with just one card, an autographed buyback of the featured player. These are original Topps cards from the past that have been repurchased by Topps and signed by the player. Like other Topps Archives Signature Series releases, there’s an added foil stamp put on the card. Not only does it highlight the card being a certified buyback, but it’s a potential safeguard against fakes. The stamp also notes that the card is from this specific Postseason release. Although they may not be included in the final set, the 2017 Topps Archives Signature Series Postseason Edition sell sheet does include mock-ups (digital images, not final cards) from a couple of players who haven’t had signed cards from the company in several years. Jim Thome’s last autographed Topps cards came out in 2009. There’s also Japanese great Hideki Matsui who hasn’t appeared on a Topps autograph since 2010. And even then, he had a very limited number to begin with. Their inclusion on the marketing material suggests their signatures could be returning to at least one product.